Bands end up at Denny's. It's not always favorable, but it is inevitable. Since my high school days of photocopying fliers in the library, bumming rides to Guitar Center, and coming up with awfully clever song titles, nights have ended at the only 24 hour spot that welcomes this type of riff raff. Sunny Ali and myself (the Kid) found ourselves in a Denny's in Alexandria VA at 3am with the Kominas and Omar Waqar of Sarmust. We were waiting for a call from punk legend Jello Biafra that would later lead us to a late night meeting in the lobby of the Silver Spring Crown Plaza where he questioned and advised us on the burgeoning scene dubbed Taqwacore at its inception. But anyhow, back to the breakfast. I was never able to get a Grand Slam before and would always end up watching one from behind my short stack across the table. 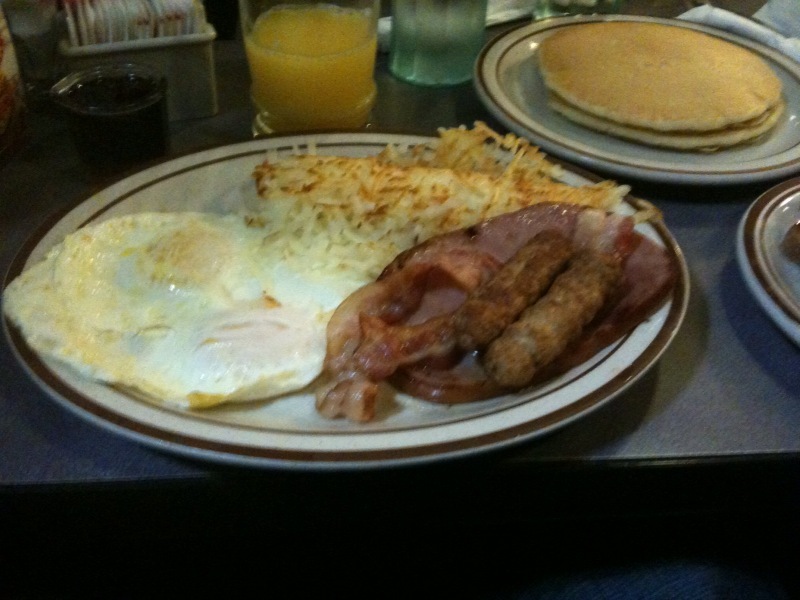 In an attempt to bridge my former favorite with this new Adventure, I got the Lumberjack Slam; a short stack, hashbrowns, two eggs, bacon, little sausages, a hunk of ham and some toast. The eggs and toast ended up being a charitable donation to Basim Usmani. The porcine components, I kept for myself...and enjoyed thoroughly. Maybe it was my road nourished appetite, but I thoroughly enjoyed a full strip of bacon for the first time. Through this Adventure, I learned this about myself: I don't like it crispy! The greasy strips were positively floppy and for the first time it was perfect, although it wasn't the highlight. It finally made sense to me pork is such a major part of the American breakfast. Beef and chicken are hardly agreeable morning meats, but ham fits in perfectly somehow. The slightly rubbery texture contrasts with the softness of hashbrowns and eggs. Add in the rest of the pork elements and what you have before you is an amusement park of a meal. The ferris wheel is the glass of orange juice to my left. Regarding the sausage: I'd like to conduct a blind taste test of beef and pork breakfast sausages. I was unable to identify any differences. This was a first. I was happy to note this parallel before thinking again and wondering if I've been buying the wrong Brown and Serve all these years. Fado's Irish Breakfast - Happy St. Patty's Day!